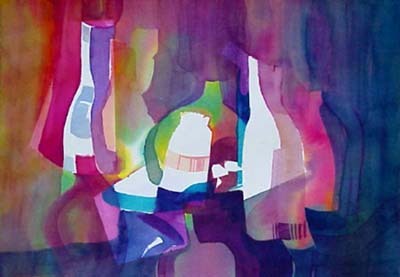 The challenge here was to develop a composition with invented bottle shapes. I used just three colors, a primary palette, for this watercolor, but my selection was magenta, yellow and cyan (turquoise) instead of the usual red, yellow and blue. I love the way the colors blend, yet stay clean. It's a case of knowing when to stop! This painting was featured in my article on color schemes in the Autumn 1999 issue of Watercolor Magic magazine. For more on creative color and color schemes, see Exploring Color.